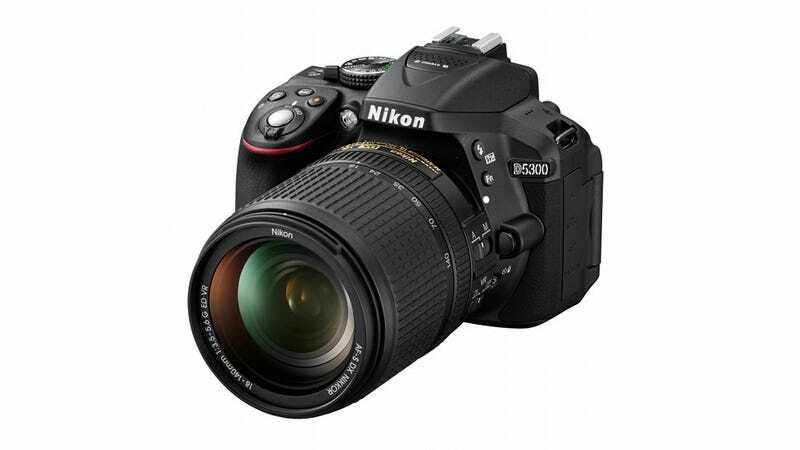 Nikon's updating its line of cheaper intermediate DSLRs with the D5300. The camera features a redesigned image sensor plus built-in Wi-Fi and GPS, compared to last year's D5200. The D5300's 24.2-megapixel APS-C sensor is the same resolution as the previous imager, but it's actually been completely redesigned without an optical low-pass filter. Lots of manufacturers are ditching their on-board low-pass filters saying they're not necessary any more to prevent sampling distortions like aliasing and moire. The advantage to removing the filter is that it allows the sensor to capture some fine detail better. Mark one for the pixel peepers. Additionally, this is Nikon's first DSLR to feature on-board Wi-FI—in the past you've had to plug in a little Wi-Fi transmitter to get wireless access to the camera. The D5300 also sports built-in GPS, which will make it easier for travelers to keep track of exactly where they took each photo from information baked into their metadata. Rather than the traditional 18-55mm kit option, Nikon will initially be selling the D5300 in a new $1400 package with an 18-140mm lens. We definitely expect to see a cheaper kit package in the near future. As with last year's camera, the D5300 s a solid DSLR, but DSLRs in this price range are even less compelling today than they were a year ago as mirrorless, interchangeable-lens cameras are serving up comparable and often superior image quality and features in smaller boxes. Available this month.